− two = 3 Required Please enter the correct value. Plunging Oil Prices: Ninety percent of the country's revenue comes from oil. But because of the low prices, Saudi Arabia's budget deficit grew to $98 billion last year – up over $60 billion from 2014's $38.6 billion deficit. At that rate of spending, the International Monetary Fund warned last October, and without further action, the kingdom will run out of financial reserves in five years. The Riyal vs. the Dollar: The riyal is currently pegged to the strengthening U.S. dollar, and speculators have been piling on bets against the currency as falling oil prices further deplete its worth. On Wednesday, Jan. 20, the Saudi government barred domestic banks from dealing in forward contracts on the currency. As of Jan. 21, the peg stands at 3.75 riyal to the U.S. dollar. Diminishing Reserves: The country has $100 billion less in oil reserves than it did a year ago. Currently, it has $620 billion worth, which is just enough to "maintain stability," TIME reported on Wednesday. The Return of Iran: Iran just returned to the global energy markets with sanctions officially lifted this past Saturday. Even before the first trade was made, Saudi Arabia's stock market plunged 5% Sunday. Of course, the country did this to itself when it flooded the market and boosted its own oil output to 10.6 million barrels per day back in November 2014. 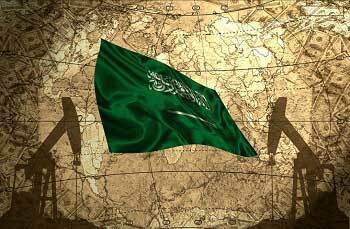 Regardless, because of these issues, Saudi Arabia faces profound challenges to its economy and political systems. Renewable Energy Will Be Saudi Arabia's "Smelling Salt"
While Saudi Arabia indeed plans to cut spending and eliminate fuel subsidies, renewable energy is garnering attention in the region…. Bahrain, Kuwait, Oman, Qatar, and the United Arab Emirates are shifting their focus as well. You see, renewable energy would allow these countries to save upwards of $55 billion to $87 billion by 2030, reported Bloomberg yesterday. 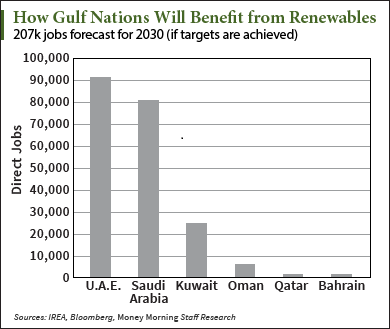 Furthermore, the Gulf Cooperation Council (GCC) published a report yesterday that revealed how scaling up renewable energy in the gulf area will not just benefit the industry as a whole, but could also create more than 200,000 direct jobs. This spells opportunity for investors. There's a specific part of the renewable energy sector — a part that Saudi Arabia has already invested $109 billion to commercialize — that could build up the country's wealth all over again. In fact, the Saudi oil minister, Ali Al-Naimi, says the country could completely stop using oil and gas thanks to this one particular renewable. Yeah with a name like " money morning" it has to be true. (Rolls eyes). Saudi has a 5 TRILLION dollar war chest. You ain't seen nothing' yet honey.